The U.S. Air Force reversed course today, deciding that you really don’t have to believe in God to hop aboard a plane and drop bombs on bad guys. Specifically, the Air Force decided that, going forward, airmen will be allowed to omit the words “So help me God” from their oath. OMIGOD! Now that I’ve heard this, so help me God, I want to . . . So the president of the United States went on television last night to tell us that 13 years haven’t been nearly enough, and we now have a whole new band of barbarians hellbent on killing us and we’ll be waging war against them for the foreseeable future, and then some. Well bully for you, Supreme Court! We’ve heard a lot about bullying over the past decade or two. And from what I can tell, pretty much everyone who is anyone is against it. We don’t bully nerds. We don’t bully gays. We don’t bully the unpretty, or the unhandsome. We don’t kick sand on the 97-pound weakling. We don’t beat up the fat kid. Or at least that’s what I thought until Monday, when the U.S. Supreme Court, in its inevitable 5-4 decision along its usual 5-4 philosophical lines, declared it was perfectly fine and legal and good and wholesome and downright American to bully – yes, I said bully – people who don’t share your religion. Well bully for you, Justices Roberts, Scalia, Alito, Thomas and Kennedy. That, kids, is the Scout Oath, the words that every Boy Scout recites with two or three fingers pressed against his forehead. The “morally straight” part almost got settled this year when the Scouts finally ruled that gay boys would henceforth be worthy of joining the club. I don’t think the founders of this organization ever intended “morally straight” to mean “morally heterosexual,” and now they’ve halfway straightened it all out. I say halfway because they still don’t allow gay adults to be Scout leaders. So now you can be gay and a Scout until you reach adulthood, at which time you must amazingly become straight or, more likely, take a hike. Them’s the rules. In 2013, if you don’t happen to believe in God, then you’re still on the outside looking in. The Scouts make it very clear: We don’t want no stinkin’ atheists. So what do you do when your kid wants to join the Scouts, and you happen not to believe in the Big Bad Invisible Voodoo Guy in the Sky? Pull up a chair, kids, and I’ll tell you the story of Kindly Old Mrs. Watkins and how she unwittingly and unknowingly led me to my firm conviction that there is no Big Bad Invisible Voodoo Guy in the Sky. It’s a long one; go grab a beer. But first, some background, because all of this might not have happened if I hadn’t screwed up third grade, when Mean Old Mrs. Murphy sent me straight on my path to hell, or wherever those of us who don’t believe in the Big Bad Invisible Voodoo Guy in the Sky go when this life is over. I had mastered the fine art of silent reading long before I entered third grade, and I reckon that was very inconvenient for Mean Old Mrs. Murphy, who more than anything liked order in her classroom. If it was reading-aloud time and the class was on Page 9 of the latest Alice & Jerry book, then Mrs. Murphy was going to make damned sure that every kid in the class had his or her page turned to Page 9 and was ready to read out loud when called upon. Well . . . everybody but me. Because I thought Alice & Jerry were supercool, and I just couldn’t wait to find out how their latest adventure was going to turn out. And did I mention that I had mastered the art of silent reading? There was the rest of the class, their books dutifully opened to Page 9, and there I’d be, inevitably, tooling merrily along on Page 30 or somewhere when Mrs. Murphy, inevitably, would call on me to read out loud. And Mean Old Mrs. Murphy, inevitably, knew exactly how to handle an upstart 8-year-old. This situation called for public humiliation! “I see Stephen isn’t paying attention again,” she’d tell the class, inevitably. And so I knew well before Columbus Day that third grade was gonna be one tough slog, because there would be just too many inevitablies before summer vacation came along. And then there was the issue of that poem we had to recite out loud, in unison, at an assembly, the one for which we prepared for months. It started out like this . . .
“The lord is my shepherd, I shall not want. Listen real close and you’ll hear 8-year-old Stevie, his nose buried in Page 30 of an Alice & Jerry book, whispering the third-grade equivalent of . . . I knew very little about shepherds and wanting. And this being Brooklyn, N.Y., there were very few green pastures that some shepherd could maketh me to lie down in. And even if we could find a green pasture, where the hell were we going to find a shepherd? And then we got to the “anointing my head with oil” part. That just sounded weird. Now, I could memorize stuff OK. I knew, for example, that Crest had been shown to be an effective decay preventive dentifrice when used in a conscientiously applied program of oral hygiene and regular professional care. I could relate to that. But there was no way in hell I was going to learn that twenty-third psalm. I mean, seriously, what’s a psalm? And why’s it got a “p” in front? And how come we didn’t have to memorize the first twenty-two before we got to it? How come I can’t skip to Page 30 but Mean Old Mrs. Murphy can skip right to Psalm 23? And so it was that my parents got me the hell out of P.S. 197 and sent me to Brooklyn Friends School when it was time to be a fourth-grader. BFS was a cool school. I quickly made friends and I became quite fond of my new teacher, Kindly Old Mrs. Watkins. Aside: Mrs. Watkins is the teacher in the picture at the top. I’m there, too. Bet you can’t pick me out, unless you went to BFS. Mrs. Watkins went around the class, and each kid had to say what his or her religion was. Just about everyone was Jewish or some variety of Protestant. 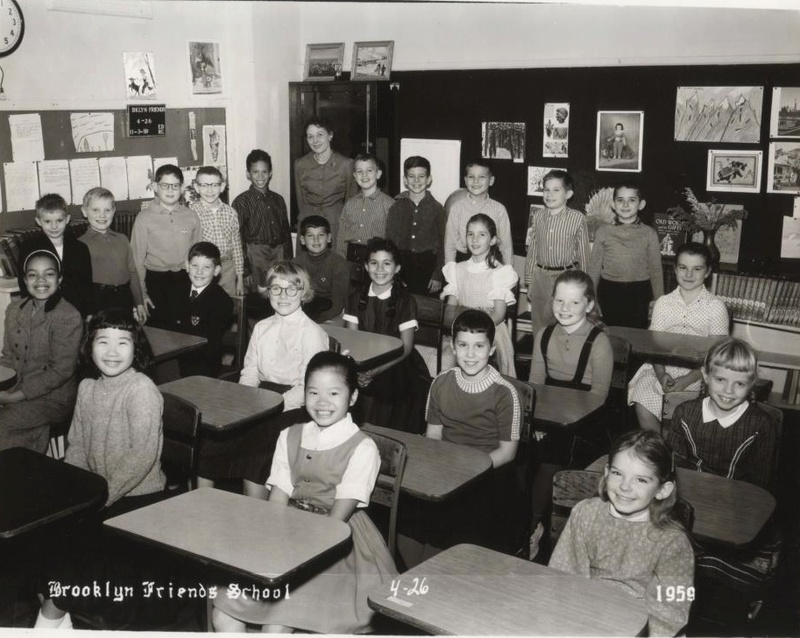 This being Brooklyn, there were a lot of Catholic kids around, but they went either to public school or to parochial school. We had a smattering of Quakers in the class, too, this being a Quaker school and all. So we were going through the class, and Howard said he was Jewish, and Ryan was Protestant, and Michael was Jewish, and Raye was Protestant, and Stephen was Jewish, and Laurel was Protestant. More than two dozen 9-year-olds listened very intently, because this was a new word. What the hell is an atheist? An atheist doesn’t believe in god, Robert told the class. WHOA!!! WHAT???? How can that be possible? EVERYBODY believes in god. Haven’t met him, haven’t seen him, never heard a word from him, but . . . he’s there, right? I mean . . . Who doesn’t believe in god? I’ll bet even Eddie Haskell believes in god. But Robert didn’t believe in god. Which, of course, meant that his parents didn’t believe in god, because really . . . where do you get your religion from when you’re a 9-year-old? If your mom and dad are Klingons, then you’re a Klingon, and Klingons hadn’t even been invented yet. And that’s when Kindly Old Mrs. Watkins set the wheels in motion. It’s been more than half a century, but I still remember the exact words she said to the class after Robert shocked the world. Robert was my friend, and if he didn’t have a religion, he certainly did not need one. Robert was doing just fine. And this got me to thinking, and once you start thinking about your religion, I reckon all hell breaks loose. If Robert was doing just fine without a god, I thought, I could do just fine without one, too. There was room in this classroom for TWO atheists! So let’s move ahead four more years, and I’m studying for my bar mitzvah. And since I attend a Quaker school a long subway ride from home, I can’t go to Hebrew School at the end of the day with the rest of the Jewish kids in my neighborhood. And besides, my father’s mother is very, very orthodox, and so I am going to be bar mitzvahed in an Orthodox synagogue. So my parents hired an Orthodox rabbi to come to our home twice a week and tutor me so that I could read my Haftorah with style and class, surrounded by about six guys wearing black suits who would be speaking no English. This part was actually pretty easy, because Hebrew is a phonetic language. Lean the letters, learn the vowels, and you can speak it even if you don’t have a clue what you’re saying. So all was going fine and well until the day Rabbi Aronoff (I think that was his name) showed up with these black straps and a black cube and told me they were tefillin — also known as phylacteries. Two more new words. They didn’t look any prophylactic I had ever heard of, but hey, you learn something new every day. Rabbi Aronoff showed me how to put the black cube on my head like a miner’s flashlight, and how to wrap the black straps around my arm, and he told me I was supposed to pray every morning with these things on. But he didn’t say what would happen if I didn’t. I don’t have time, I told him. Find the time, he told me. Yeah, like that’s gonna happen, I said to myself. So for a few months, Rabbi Aronoff would show up twice a week to tutor me, and every time he’d start out by asking me if I’d been putting on my tefillin and praying. And remember . . . this whole atheist thing is still nagging at me. Now Rabbi Aronoff was a decent guy, so when it came to answering the tefillin question, I most definitely did not want to hurt his feelings. So I told him, sure, I’m putting on my tefillin. You betcha. I waited a bit, and, remarkably, no lightning bolt crashed through the window. It turned out you could lie to the rabbi and nothing would happen. A couple of months later, I stood among a bunch of old men, all wearing black suits, facing a large congregation — men downstairs, women upstairs — and recited my haftorah. I didn’t have a clue what I was saying, but I said it just fine. And, again, amazingly, no lightning bolt crashed through the window. Half a century later, I’m still standing. Robert had it right all along. There is no Big Bad Invisible Voodoo Guy in the Sky. So here’s a tip of the hat to Mrs. Watkins, who set all the wheels in motion. My friend Mark sent me this piece because he knew I’d find it interesting. Boy did I ever. 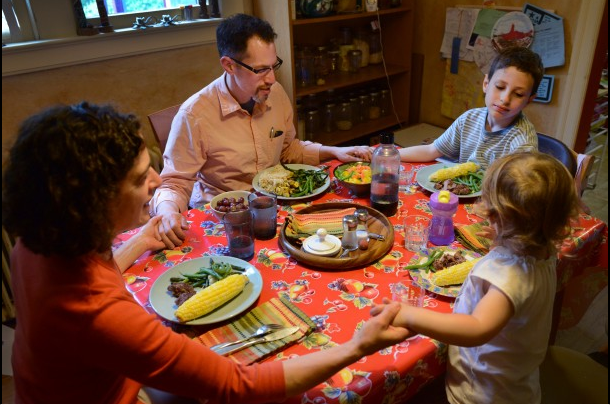 (Linda Davidson/ The Washington Post) – Atheist Sigfried Gold, his wife Galia Siegel, and children Beatrice Gold, 2, and Solomon Gold, 8, say a serenity prayer at dinner at home Tuesday in Takoma Park, Md. Gold launched a regular prayer schedule to comply with a 12-step program for food addiction. And the story goes on to say . . .
An atheist, Gold took up prayer out of desperation. Overweight by 110 pounds and depressed, the 45-year-old software designer saw himself drifting from his wife and young son. He joined a 12-step program for food addiction that required — as many 12-step programs do — a recognition of God and prayer. Four years later, Gold is trim, far happier in his relationships and free of a lifelong ennui. He credits a rigorous prayer routine — morning, night and before each meal — to a very vivid goddess he created with a name, a detailed appearance and a key feature for an atheist: She doesn’t exist. While Gold doesn’t believe there is some supernatural being out there attending to his prayers, he calls his creation “God” and describes himself as having had a “conversion” that can be characterized only as a “miracle.” His life has been mysteriously transformed, he says, by the power of asking. And then the story goes on to talk about all these atheists who pray. It’s a fascinating piece . . . and I’m really happy for this guy Gold, who apparently has found a successful way to lose weight. But he should stop calling himself an atheist. If you want to believe in a big invisible man in the sky or a “vivid goddess” whom you’ve actually created with a name — fine with me. Knock yourself out. Whatever floats your boat. Just don’t go calling yourself an atheist. Among other things, it’s insulting. And more than a little condescending. It’s like calling yourself a Christian and telling everyone that you don’t believe in God and you don’t believe Jesus ever existed, but they should nonetheless consider you a Christian because you say you are. It belittles what true Christians believe. Same as saying you pray every day and you’re an atheist. That’s baloney, which this guy Gold must know is fattening. And why are we here, exactly? BATON ROUGE, La. — It would have been easy to mistake what was happening in a hotel ballroom here for a religious service. All the things that might be associated with one were present Sunday: 80 people drawn by a common conviction. Exhortations to service. Singing and light swaying. An impassioned sermon. There was just no mention of God. 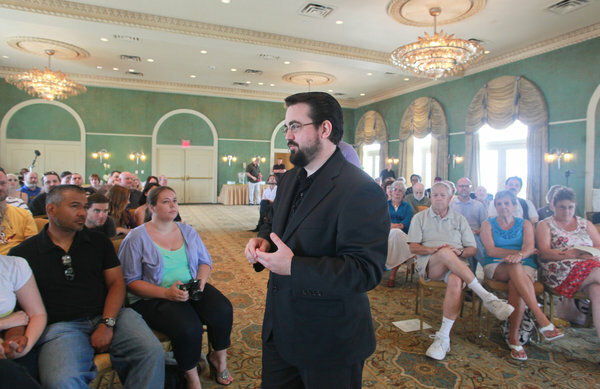 Billed as Louisiana’s first atheist service and titled “Joie de Vivre: To Delight in Being Alive,” it was presided over by Jerry DeWitt, a small, charismatic man dressed all in black with slick, shiny hair. I’m always happy to see people who are happy, but this just seems ridiculous to me. “Atheist church” is an oxymoron. And congregating with other like-minded people to sing songs and celebrate your communal disbelief in an imaginary man in the sky is just . . .
Well . . . silly. I’d much rather go to the ballpark.